line level input with fader.go.pan. – also a single neever microphone/di recording amplifier. – also a 5 stereo input control room monitor section with stereo.reverse.mono.left solo.right solo.speaker a.b.c. all up a pretty powerful tool made to last .with all transistor amplifiers for maximum fatness with minimum puss. a big clean sound. and in a beaut portable cabinet. it’s made to be configured as a studio mixer and controller. to receive and mix a sound card’s multi-track outputs, and mix into a perfect new stereo thing. it’s a smart little bug!r . can listen to and switch compare all the musical stereo sound outputs u know u need to. select the MIX output OR external stereo inputs (sound card monitor outputs) E1 & E2, OR check/listen to the neever mic amp or the echo send. throw the sound around to check stereo – reverse- mono. left right solo. and then control 3 pairs of monitoring speakers in a studio. 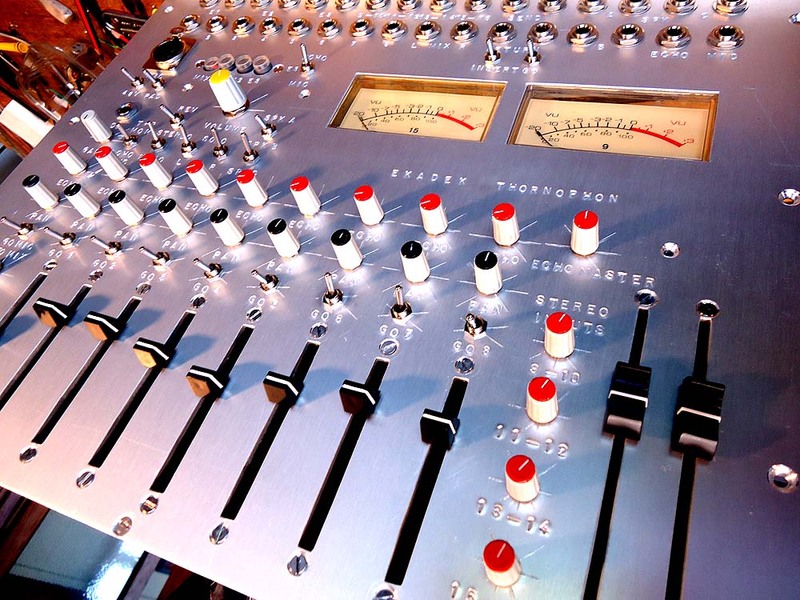 manual mixing with a panel of sliders and pans is the best method to balance a mixture of sounds. when u can move two or three faders at ONE time .. u can find , and then fine tune resonances in the harmonic structures of the sounds. extracting more peaks and valleys. adding life. finding those parts gets to the spark between the instruments. the distance between things locks in and the depth expands. a computer mouse can move one fader or click one button at a time. what the hell use is that? ok . so u have a computer fader panels.. good choice. ..but then ur still just inside the box. so further more i reckon the mixing sounds better done outside in a real amplifier mixer with faders , and outboard special fx and maybe even a room mic. give a poor computer smacked up thing more oomph – driven energy.